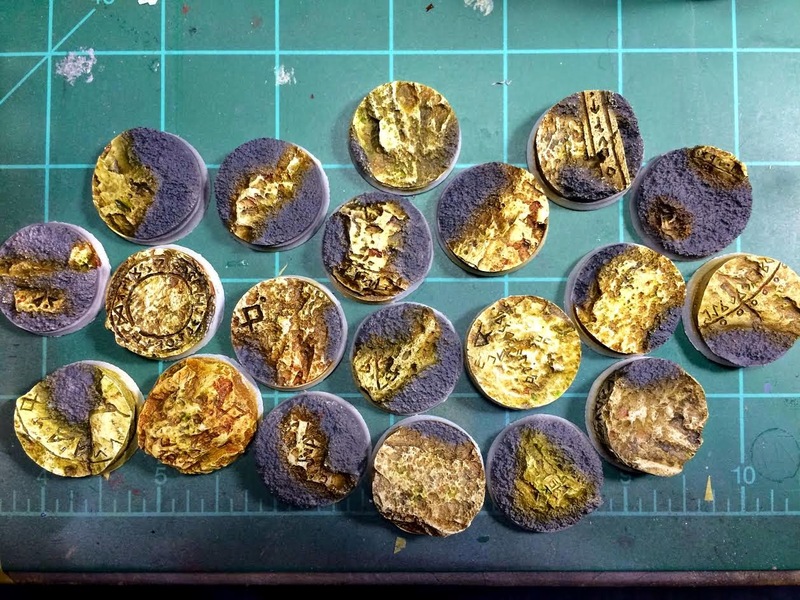 I finished the stone on the Secret Weapon Miniatures bases I am basing this Space Wolves commission on. They dark grey will be drybrushed with a couple of different lighter greys and then given an earth-toned pigment wash to simulate dirt. After the models are pinned to the bases, I will go back and add snow effects. The stone was accomplished by priming the bases white. I then dabbed various colors of oil paint (umber, grey, brown-black, green, sienna) in a random pattern on the stoney areas and proceeded to mix all of the paints together. While the paint was still wet, I took an old t-shirt and wiped a majority of the oil paint away, leaving the mixed colors in the nooks and crannies. I dipped a rag in some white spirit to wipe away even more paint to let more of the white base coat show through on the more prominent edges.